The Act of Selling a product or service to a customer is a vital factor which drives the economic and commercial life of humanity. But as in many other human activities, the deeper significance or purpose or values of the activity is lost in the outer utilitarian and commercial motives. This is not a moral judgement on these motives, which are part of the evolutionary growth of individuals and motives. However, by awakening the deeper significance of the activity it can be elevated to a higher level, which in turn can lead to a more accelerated higher evolution of human beings. There is a certain amount of literature on the professional dimensions of selling, especially in the west, though it is not as extensive as in other area of business and management like for example in finance or production. But there is very little thinking or research on the inner dimensions of selling. This article examines these less explored domains of selling in its three inner dimensions: Psychological, Ethical and Spiritual. The importance of customer satisfaction is now well-recognised in modern management thought and practice. There is also a growing recognition of the importance of the emotional dimension in enhancing customer satisfaction. There is at present a near consensus among marketing gurus that the positive emotions induced by the product or service is a vital factor in attracting, acquiring, retaining and delighting a customer. How to awaken such positive emotions? The most important factor is the nature or quality of the direct contact between the customers and what we may call as the “selling environment” made of three elements: First is the product sold; second is the physical environment inwhich the customer comes into contact with a product like for example the showroom; third is the front-line salesmen or worker who delievers the product or service. The aesthetic element in the product and the physical environment is decisive factor in awakening positive emotions in the customer. A much more important factor is the human element— the seller or the frontline worker who comes into direct contact with the customer. In this domain most of the sales personal and burdened with an overwhelming pressure to achieve the sales target. In more progressive companies there is a greater emphasis on customer delight and empowerment of the frontline worker. In training and development of the salesperson, the predominant stress is on external factors like professional competence, dressing properly, pleasant and smiling appearance, body-language communication skills. All these may be needed to become an effective salesperson. But what is not equally recognised is the importance of the inner psychological condition of the seller made of her thoughts, feelings and attitudes. Before coming to the practical implications of these inner factors for selling, let us examine some of the related psychological principles which are well known to Eastern yogis and seers. The first principle is that our individual mind and heart are not an isolated monad but mingles with the minds and hearts of others in the mental atmosphere. The second principle, which follows from the first, is that our thoughts, feelings and attitudes are more contagious than microbes. Our thoughts, feeling and attitudes induce a similar or corresponding inner reaction in the other person with whom we interact. A positive inner condition or attitude induces a corresponding positive inner response in the other person and conversely a negative attitude creates a negative reaction. And most of us, even with a minimum of inner sensitivity, can instinctively face the inner attitude or feeling of the other person towards us. The third principle is that any outer behaviour or communication to be sincere, authentic and effective has to be a spontaneous expression of a corresponding inner state of consciousness. These inner, psychological factors and principles have practical implications for training and development of sales people. The first implication is that instead of an exclusive focus on external behaviour, there must be a greater emphasis on harmony or correspondence between the outer behaviour and inner state. Take for example that famous smile on the face insisted upon for all those frontline workers like sales personnel and receptionist. In a deeper and more integral approach there will be a greater emphasis on cultivating an inner state of goodwill and a genuine concern for the wellbeing of the customer and a matching outer behaviour and action than a mere muscular widening of the lips. When there is this harmony between the inner state and outer behaviour in a person, then whether he or she smiles outwardly or not does not matter much. His or her inner attitude, thoughts, feelings and outer actions communicate much better than a smile. The ancient Indian surgeon, Sushrutha states in one of his treatise on surgery that a surgeon must constantly and persistently contemplate in his thoughts, feeling and imagination on the wellbeing of his patient. This is a deeper and subtler approach to customer satisfaction than the predominantly behavioural approach. The corporate world as a whole is in the process of acquiring an ethical and social conscience. The concepts like business ethics, corporate social responsibility and environmental sustainability are on the threshold of becoming some of the core values of business. For example, the editorial of a recent issue of Harvard Business Review states: “In recent year corporate social responsibility became an imperative.” Recently, an initiative of the students and faculties of Harvard Business Review have given birth to “MBA Oath” with strong ethical overtones. The salesperson has to take into active consideration in her thought as well as in practice, this new corporate environment, which is becoming more and more sensitive to ethical and social values. However let us move a little deeper and wider from the present forms of corporate ethics to the universal principles of ethics. What are the rock-bottom principles of ethics? They are: Truth and Goodness. For the salesperson truth means honesty and transparency in all transactions especially with the customer. Goodness means genuine concern for the wellbeing of the customer, people and the society. This raises many practical and difficult questions related to the practice of ethics in sales. There may be still some or many young salespersons who may ask the question why at all ethics or why should I be ethical? There are three reasons why. First, to be ethical is to be truly human. Ethics is part of becoming a better human being and the higher laws of life. Second, as we have already the corporate world as a whole is becoming increasingly sensitive to ethical issues. The third reason is that ethics and values generate goodwill, trust and respect in people, which ultimately leads to success in the long-term. Once we accept this need to be ethical, the next issue is the difficulties and dilemma involved in practice of ethics in sales. Though the corporate world is becoming more receptive to ethics, there are still large part of the corporate landscape and its managers and bosses which or who are focused on the bottomline and not interested in ethics and values. Even the more progressive companies which are serious and honest in implementing values, when they are confronted with a fiercely competitive environment or in a state of financial difficulties, are willing to compromise on ethics. In such an environment how a salesperson, as an individual and as a community, deal with the ethical problems and dilemmas of her profession. For example if the bosses of a salesperson compel her to give false information about a product or offer bribe to get the contact what she can do? Similarly, a salesperson may face dilemmas between customer satisfaction and social wellbeing. For example, is it right to sell socially harmful products like cigarettes, substandard drugs or liquor inorder to satisfy the addicted, unethical and uncaring customers? We must admit that living ethics and values involves a certain amount of courage, risk and hardship. But the risk and hardship can be greatly minimised if we can rely on a higher divine power, which is within every human being, and constantly call, aspire and pray for Its help, guidance and protection. For example you are working as a salesperson in a cigarette factory and you don’t want to do the job because you are awakened to the harmful and unethical nature of the product. But your financial or family condition is such that you can’t leave the job. Whenever you are confronted with such ethical problems or dilemmas lay down the problem frankly and honestly to the divine power within you. Call and pray for its help and guidance. Remain constantly in this state of prayer and aspiration without any preference for a particular course of action or solution. If you can remain in this state for some time without getting discouraged, an inner or outer indication will tell you what to do or the divine power will arrange things in such a way that problem is resolved. The sales community has to consciously organise itself on the lines described above in order to make it into a strong moral force. Beyond ethics and values there is something like a universal Purpose, Law or Truth or Mission or Destiny of things which we may call as the spiritual dimension. What is this universal truth behind the act of selling? To answer this question we have to go back to the origins of commerce. The root of commerce is the interchange or barter of goods and services between the producer and consumer. If we probe deeper and ask what is the basis of this interchange we will hit upon one of the fundamental and universal Laws of Life: interdependence. We are all part of an interlinked and interdependent unity of life. In our planet, no individual or collective human organism can be entirely independent. Every human organism will have something which other don’t have and lack something which others possess, which creates the need for interchange. Money is the material symbol of this interchange. And the salesperson is the human representative or instrument of this universal Law of life. Every salesperson has to consider himself or herself as an instrument of this great Law of Life, which gives an august spiritual dignity to the profession. In this spiritual perspective, the mission or purpose of a sales person is not just customer satisfaction but perfect mutuality and harmony between the supplier whom she represents and the customer who she serves, without compromising on ethics and human wellbeing. This means to arrive at a mutually satisfying and harmonious relationship between the supplier and the customer interms of mutual needs, interest, aims and wellbeing, which is at the same time in harmony with the whole being of the larger whole of life of which they are apart. The sales community has to figure out how to proceed slowly and progressively towards this ideal from the present condition. 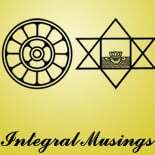 This entry was posted on January 11, 2013 by integralmusings in Integral Management.